In the fall of 2013 at Toronto and East York Community Council, I recommended, along with my colleagues Councillor Bailão and Councillor Layton, that City Planning staff review the policy context, built-form and heritage value of the properties on Queen Street West between Bathurst Street and Roncesvalles Avenue. I have heard from many community members that protection of the heritage values and character of Queen Street West remains a priority as we welcome change to this street. The study will involve public consultation to clarify what defines the street character and to develop a community vision for the future. Transit capacity and parking supply will also be reviewed. City Planning staff are now beginning the community consultations. I invite all of you to attend and share in this work. Please see the invitation information below for details. The City of Toronto holds public consultations as one way to engage residents in the life of their city. We invite you to get involved. City Planning staff are undertaking a study to review the policy context, built form standards and heritage character of the properties on both sides of Queen Street West from Bathurst Street to Roncesvalles Avenue. The study will also look at transit capacity and parking in the vicinity of the study area, focus on understanding the character of the street and creating a vision for future development. Please join us for this important kick-off meeting where you can learn more about this study, ask questions, and share your comments and ideas. To speak to the planner directly, contact Avery Carr, at 416-392-0423 or acarr2@toronto.ca . You may mail your comments to the planner at Toronto and East York District, 100 Queen St W Floor 18 E Toronto On, M5H 2N2. To provide comments online, use the link below. Personal information received at community consultation meetings or contained in correspondence with the City is collected under sections 8 and 136 of the City of Toronto Act, 2006 specifically for creating a public record of information potentially relevant to making an informed decision. Questions about the collection of this information may be directed to the Planner listed above. Toronto Environmental Alliance's "Enviro Report Card"
Very happy to have received an A+ for my work in Council on the Toronto Environmental Alliance’s “Enviro Report Card”. Canada Day in High Park! 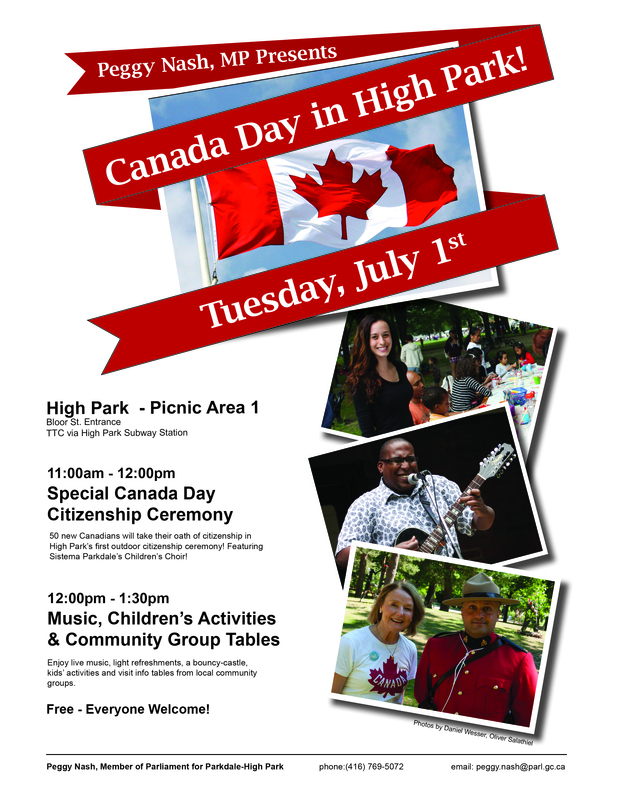 Join hundreds of your neighbours at Peggy Nash’s annual Canada Day celebration in High Park! This year she’s hosting a special Citizenship Ceremony where 50 people will take the oath to become Canadian Citizens. This fun, free event will feature music, children’s activities and a chance to get acquainted with some of our many active community organisations who will be tabling onsite…and it all takes place outdoors in beautiful High Park! The citizenship ceremony will take place from 11am-12pm and will be followed by light refreshments. Ward 14 Camp Registration – some spots available at the Parkdale camp registration! You can register in person at Masaryk-Cowan CRC (currently a waiting list) or at Parkdale CRC. For online registration go to toronto.ca/torontofun and follow the link to Toronto Fun Online. Touch Tone Registration call 416-338-0000 and follow the voice prompts. You cannot use TTR after the program start date. You can also use operator assisted by calling 416-338-4386 and speaking to a Customer Service Representative. For new family accounts or existing account updates, families can call 416-338-4386 and speak to a customer service representative. Thank you all for your heartfelt responses. I will let your comments speak for themselves. You can also see the great response on twitter via #ParkdaleLove. I am so proud to represent Parkdale – one of our many great neighbourhoods that make up Ward 14. I love Parkdale because we embrace our neighbours – we provide for those who need help. If neighbourhoods were measured on how we treat our most vulnerable we would score pretty high and I am proud of that. What I love is being by the lake and hearing the Gulls cry in March and April. I can grab a coffee, a new plant, and some new shorts all within a block. Parkdale is one of the most diverse communities in Toronto. Beautiful architecture on every street. There is always a new business or event to check out. It’s a 5 minute walk to the beautiful waterfront and numerous parks. Fresh veggies and fruit everywhere! Parkdale is my home. This is where my heart is and always will be. I remember 22 years ago when I heard my new husband say, we are going to live in my parents home where I grew up on Springhurst Avenue (exhibition end) to help care for his ailing mom. The house was in Parkdale and I thought “ Oh my god “ I had heard there was so much drugs and hookers etc. (even back then) TODAY, no matter where you live you should be able to work things out with your neighbours, go to work, and be an example for your family and others. As soon as we moved to our Parkdale home, I loved being by the water, and we have enjoyed the diversity, I don’t drive and can get around anywhere I want to go, and my how businesses have come and gone. We watched as we saw the new Liberty Village emerge. We see how King and Queen street have developed so quickly and its now an area that outsiders would love to buy a house in. My husband also predicted over 10 years ago how Parkdale was going to be the place to be and he was right. As a small child he remembers Parkdale was upscale, and our street is upscale. NOTE: We aren’t going anywhere! Parkdale…the land of innovative social housing such as Edmond Place…bringing culture and art close to home through independent galleries and Pia Bouman School of Ballet and Creative Movements…and dozens of independently owned stores and restaurants that cater to all budgets and tastes. I love Parkdale’s walkability and the Victorian architecture. My maternal grandmother lived there, so it is a special place for me. I visit as often as I can. Our neighbourhood is like living in a small town. This diverse community has an unbelievable sense of community . We work together to provide a good social, cultural,enviromental and economic back drop for the city of Toronto. We are the community that is envied all over the city. I have lived in Parkdale since 1999 and absolutely love this neighbourhood. Why? Mainly because it truly is a neighbourhood, where people know each other and look out for each other. I can walk to all the shops I need. I can go to the park or to the lake. The incredible diversity of this neighbourhood (culturally and economically)makes it a wonderfully interesting place to live. The people, the shops, the restaurants, the bars, the parks, the events, the farmer’s market… I love it all! I lived in Parkdale for almost 2 years. I loved Queen Street and the brunch restaurants, cafes and bars there. I still go to Parkdale to meet friends who live there. I go to the flea market at Queen and Dufferin. I still have a membership to the Toronto tool library, my friends and I put together planters for growing vegetables on his deck and built a picnic table, and a shelf using those tools. Parkdale is one of the nicest areas in the city…I love living in the hood. A diverse neighbourhood, full of art and culture. East access to Lake Ontario, Martin Goodman Trail and Sunnyside Beach! Parkdale is a happening, vibrant art and cultural scene! For it’s sense of community and inclusiveness. It’s walk-ability and proximity to the lake, high park, restaurants and bars. It’s musicians, artists and progressive politicians and community reps. For organizations like PARC, Parkdale Project Read, the WEFC, all unparalleled in the city. The many great schools, health centres, amazing library. It’s been my home for 27 years and I can’t imagine living anywhere else in Toronto. Parkdale a diverse oasis for all to enjoy by the lake, by the park in the city of many cultures and colours. Because there are chestnut trees on my street. Because I can walk or cycle to High Park and the lake. Because of the plethora of galleries. Because I have had the same wonderful doctor at the Parkdale Community Health Centre (where I sat on the board for six years) for twenty-five years. Because Cherry Bomb has the best coffee in town. Because I have great neighbours. Because my pharmacist knows my name. Because every August I can hear the sound of hundreds of people chanting as they carry Ganesh to the Sikh temple near my house. Because Parkdale Project Read gives people hope. Because we raised our daughter here. Because of the crew at West Side Cycle. Because I owned a retail business on Queen St. for six years and had great customers. Because we have a fantastic MP and an equally fantastic MPP. Because the Workroom is a brilliant concept. Because of the weekly Farmer’s Market at Sorauren Park. Because of my book club. Because of the Tibetan restaurants. Because the Greek church on Sorauren rings its bells on Sunday morning. Because I was given an opportunity to adopt a tree at the new town square and will be responsible for watering “my” tree for the next year. Because my friend Peter’s sculpture sits outside the Parkdale Library and on the walls of Masaryk Community Centre. Because everyone is welcome at Amico’s annual free feast. [A] place teeming with well-supervised kids, strangers who frequently say “hello”, and people on bikes and walking their dogs. Because of the vibrant culinary and musical life on Queen and up Roncesvalles, he would see hundreds of couples and groups of friends (many of them from other parts of the city, or even of the world), packing the excellent venues all up and down the streets. He might stop and admire a couple of neighbourhood youngsters working on their busking chops, check out a world-class art gallery, or just sit on one of the many public benches and watch the families drift by. In every city neighbourhood there will always be the odd shifty character, but surely the safest places are those where the businesses are engaged, the locals are friendly, and community life is focused on the pedestrian. Parkdale is just such a place. Come and visit – see for yourself!!! I love Parkdale because Parkdale loves everyone. I have lived in Parkdale for over 25 years. I love Parkdale because Parkdale accepts all comers. We accept them without judgement. We accept the young families and the senior citizens, the artists and the foodies, the partiers ( OK, not so happily on my part) and the folks with problems who are not so lucky as we are, and we accept the folks who are way more lucky. We avoid judging and pointing fingers and take folks as they are. This is a shared world and I feel blessed to live in Parkdale. I live side by side with people from every conceivable walk of life, economic bracket, 25 or so countries. I eat, shop and live in Parkdale. I go to hear live music in Parkdale. There’s no place like it! Parkdale is model neighbourhood of social Integration; I’ve probably seen no other area of the city as diverse as Parkdale. It’s diversity and welcoming nature are it’s core strengths. Parkdale is resilient, tenacious, and soulful – just like it’s people are. I love Parkdale because when I lived on Cowan Avenue the entire street made Halloween so special that the street would be closed off and buses of kids would come from less fortunate areas to trick or treat. One year I ran out candy at 900 kids. I’ve never had a better Halloween than I did on Cowan Ave. I also love Parkdale because when I registered my Basset Hound puppy with the Canadian Kennel Club under the name Sherman of Parkdale – my neighbours got together and held a “Welcome to Parkdale Sherman” party. We have thick skin and Parkdale rocks. I love Parkdale because when a problem comes up the community comes together to solve it, rather than shutting the gate and slapping on a padlock. friendliness and its inclusiveness are just some of the reasons this is the best place in Toronto. 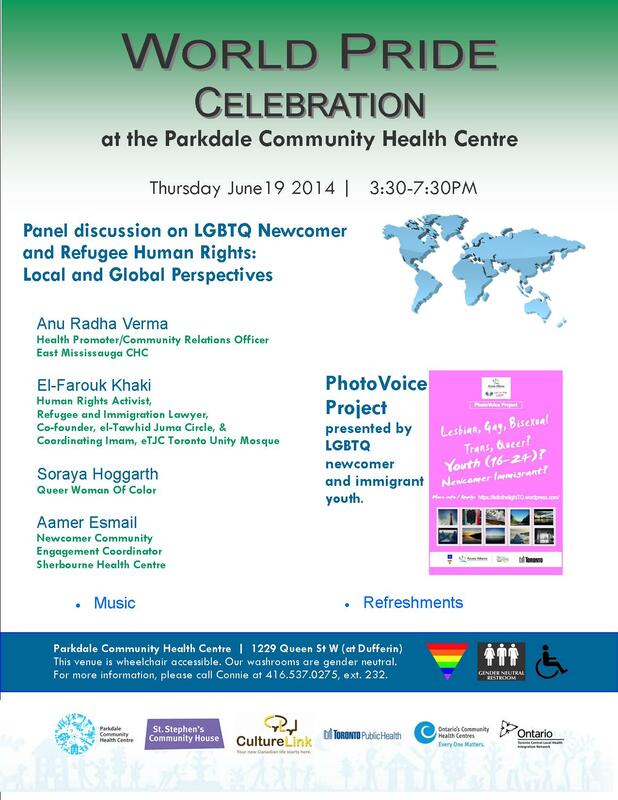 Creative and politically engaged citizens make Parkdale safe, caring and a model for success around the world. I love Parkdale because of PARC! I moved to Parkdale/Roncesvalles Village in 1990. If I were to leave this neighbourhood, it would be to leave Toronto altogether, because I wouldn’t live anywhere else in the city. It’s the small town friendliness combined with the big city services, culture and diversity that makes this area so special for me. I’ve lived in Parkdale since 1994. It was an unknown to me having lived in the Beaches and the Annex previously. Immediately I loved the diversity – socio-economic; cultural; ethnic; psychiatric. The gentrification continues to settle in but, for me, the flavours have not been lost…yet. I love seeing all the new young families (having already raised my own). My wife and I love the proximity to High Park; to the Lake; to the market at Sorauren Park; and the wonderful array of shops that AREN’T chainstores. And yes, there are the difficult moments of encountering the broken and suffering who people our streets…but this is life. It is out there, not sequestered behind the facades of middle/upper class normalcy. I have heard many people say, including myself, that they feel safe in Parkdale, and sometimes, yes, they feel sadness encountering the walking wounded of us. And are they not great mirrors for us all – for our own suffering which we hide and mask? Summon the Parkdalian voices who wouldn’t live anywhere else in the city, even if they could! I’ve lived all over Toronto, and Parkdale is the place where I’ve felt the biggest sense of community and acceptance. Simply living here has made me a more tolerant person. As a Parkdale resident and the father of a young boy, I just want to say that I support all-ages parties, teens (and tweens) should be able to go out dancing too. Parkdale, to me, means diversity. Parkdale is bohemian, multi-cultural, hardworking, unique and fiercely proud and independent. It is a vibrant neighbourhood where people live, grow, prosper and thrive. It is a place to be proud of. Because of the lively political discussions during meetings at the Parkdale Women’s Book Club which I joined close to 14 years ago, the great choices offered when looking for roti dinners with my son, munching on Tibetan momos, trolling for antiques on a Sunday afternoon after a bellyful of brunch, taking my son to Buster Keaton films at the Revue, and enjoying recommended movies for 16 years by the Film Buff Family! Lots of other reasons but these are just a few. Parkdale=arts, music and a great place to live. I am 60 years old and have lived here all my life. There is no other urban setting that I would want life in other then this one. I might add that I have worked and lived in other countries but this is always home to me. What makes up this community? How and where do I begin? Local shopping with great produce and meats etc. The creative forces in music, art and the alike, that live and work here. I guess I could go on but these are a few reasons. I have always lived in Parkdale when I have lived in Toronto. There is beautiful architecture, it is close to the lake and High Park. I could not imagine living in any other neighbourhood in Toronto. I have lived on Dufferin, Cowan Ave. Indian road, Garden Ave. and now Pearson Ave. Every week I make sure I take a walk on Queen just to keep life real. It is wonderful to see the Tibetan community blossom as people walk the streets with their prayer beads. I walk to the Revue Theatre or go to the lakeshore to have a peek at Caribbean parade. I have participated in Mad Pride parade and Take back the Night march. You feel the positive activism with the ‘street news’ on the lamp posts. I also appreciate how active our representatives on the municipal, provincial and federal level as I see them at many community events. I had left the city for 15 years and when I came back I recognized many people on the street from when I lived here before. It is a community, diverse, vibrant and edgy. …To preschooler me, High Park was a vast tree filled place that had more playgrounds than any other in the world, each one different. My Daddy walked me to all of them and took me to feed bread to the mallard ducks in the pond too. Parkdale made me a nature lover. My mother took me shopping and there were so many churches with steps on them that I insisted climbing up and down the steps of each one before letting us walk on. What a patient mother I had! I would look in the windows of all the delicatessens as we passed by and they had mouth watering pastries, all kinds of smoked hams, cheeses and even very tiny plastic dolls for sale, dolls you could fit in a child’s pocket. I would beg my mother for some of everything and she indulged me. At Christmas and Easter the delicatessens would have wondrous little animals made of chocolate or marzipan with gold foil rings through their noses in their display cases. It was the Nutcracker Suite Christmas come to life. In my childish naivety I thought all main streets were full of delicious delicatessens like this. But no, it was just the Polish neighbourhood delis of Roncesvalles and I was the wide eyed gluttonous visitor. I knew heaven lived on Roncesvalles! At the corner of Roncesvalles and Fermanagh was a drugstore with an enormous tub of ice cream of every flavour, packed in brown wax paper tubes. The druggist would personally get a cone and because of the tubes, he didn’t need a scoop. He just slid the tube of ice cream into the cone, then slid the paper off the ice cream, et voila! The drug store’s not there any more but the delis and High Park still are. Parkdale was the most marvellous place to be when you were a child. I still see families happily enjoying the High Park playgrounds. Parkdale is still a neighbourhood of tree lined streets where you can get close to nature. I am still at heart a Parkdale girl. I love Parkdale because my two beautiful children were born here and spent the first years of their lives growing up in a wonderfully diverse and resilient neighbourhood. Parkdale isn’t wonderful. I walk it’s streets everyday. There are homeless citizens. There are CAMH citizens. I see suffering every time I walk out of my door. There are terrific restaurants, coffee houses, art galleries. We have a library. What could be more amazing than that? Next door to me there’s a methadone clinic. They are good neighbours. We have tree lined streets and beautiful homes. We have people who will look you in the eye and smile as you pass on the sidewalk. Parkdale isn’t perfect, it’s not wonderful, but it’s a real place to live. I love Parkdale because you can be yourself without fear. You can be who you are. You do not need to pretend to be something you are not because you are scared you will be bullied or judged. No. That does not happen in Parkdale. Parkdale is a neighbourhood of tolerance and compassion. Anyone who says otherwise does not know Parkdale and does not live in Parkdale. I’ve lived in Parkdale for 17 years because I love its diversity, its sense of community and many creative citizens. I live on the Parkdale side of Roncesvalles. There is, especially in the last few years, a striking contrast between new upscale establishments and the old world of the kind of people who have forever been scraping by and hanging on. I like to believe that the people who are moving in here have an appreciation of this place and the people who are Parkdale. There are often notes like that around Parkdale. People talking to people. We might not know each other, but we know we are all here and generally, doing the best we can. One of the most amazing things about Parkdale is Phoenix Place and their Green Phoenix project. Not only are people living with respect for each other, they are attempting to live with respect as a part of a larger creation. I love Parkdale because it is such an incredibly kind neighbourhood. I know all of my daughter’s friends’ parents. I wouldn’t have chosen any other place to raise her. Queen Victoria said, “Beware of artists. They mix with all classes of society and are therefore most dangerous.” As a musician, it’s the unequaled variety of Parkdale that I love. From Tibetan Monks to Emo Hipsters, from CAMH patients to BMW driving homeowners – Parkdale is the true microcosm of the multicultural Greater Toronto Area. Our family doesn’t actually live in Parkdale but we have friends that do and our kids go to Queen Victoria School. My son who’s in grade seven often goes out for lunch on Queen Street with his friends, and other than some quick talks about being aware of his surroundings that he would get in any neighbourhood, I’m thankful for the “colour” of Parkdale that makes him aware of the diversity of humanity in the great city of ours. I’ve also recently become obsessed with the history of the Village of Parkdale and have been on a ROMwalk tour of the neighbourhood and have been reading about the rich, wonderful history of the area. Not only does Parkdale have a history that’s central to the development of the west end of Toronto, but I do believe that it has a present and future that is central to who we are as a city and as a country. The reason I love Parkdale is because it is so diverse. Yes, it can be challenging to be around people who are often so different than I am, but the challenge is only to my own preconceptions. The diversity offers a glimpse into how complicated and beautiful this world really is. I went to school at Parkdale Collegiate and formed friendships that have lasted over fifty years. It was a great community then, and still is.. Sure there are a few problems, but I’m proud to say I was and still am a Parkdalian at heart. As a twenty year resident of this amazing neighborhood, why I love it is too numerous to list. It’s diverse, rich and poor and everything in between. Its every culture. It’s old and new. Its exciting and vibrant and engaging. In short, it’s a wonderful place to call home. We love Parkdale because it is home to our Friendly Spike Theatre Band, a group of psychiatric survivors and consumers and people with disabilities, who use theatre as a means to share personal experience and make a more equal culture for everyone. The company is proud recipients of the Toronto Arts Foundation ACE (artists community engagement) award (2012) and in 2011 our director Ruth (Ruth) Stackhouse received the City’s prestigious Access Award and the Queen’s Diamond Jubilee Medal (2012). This summer we are hosting workshops in autobiographical story telling at May Robinson Apartment Building Recreation Room, 20 Westlodge Ave., in Parkdale on Friday Nights from 5:30pm-9:30pm (July 4th – Sept 5th) and EVERYONE is welcome. I’ve lived here for over 20 years, and there isn’t a better, more family oriented neighbourhood than Parkdale. Parkdale has always been a welcoming hub for immigrants seeking refuge and artists seeking inspiration. We are rough around the edges, but we are as big-hearted as they come. Walk along Queen St and watch out for the dust-covered antiques on the sidewalk, smell the freshly cooked roti in the air, see the Tibetan monks in their saffron robes checking books out from the library, bump into young weekend partiers gathering outside bar entrances and old immigrant grandmothers walking with their grandchildren to the lakeshore. We’ve got writers, activists, filmmakers, health workers, business owners, designers, cyclists, poets, students, community gardeners and yes, some CBC types. I live in ParkDale. ParkDale is alive. We are are a very diverse eclectic neighbourhood that exemplifies what community really means. Every walk of life lives here. And this brings balance to a some what unbalanced world. The City of Toronto is vibrant because of neighbourhoods’ like ParkDale. You have got to live here to know the values that are living within a community that cares. I live on Grenadier road and I’m glad to say that I know more than half of the residents on my block. (Both sides of the street). That says it all. It’s a great neighbourhood. We love Parkdale because we love the Gus Ryder pool, there are good prices for great haircuts, the sewing Workroom is excellent, there are the best Victorian houses anywhere and people who are compassionate, fascinating and crazy unique. I love walking and biking and always meeting different people I know in different parts of the neighborhood – the parks, the library, the stores and the sidewalks. I love being so close to the water. I love the diversity. I love Parkdale. I grew up there as did my parents and my children. Though I moved away in the 90s and now live downtown, I would move back in a flash. I visit often and shop there frequently. I love Holy Family School and Queen Vic. I love Parkdale Collegiate & Parkdale Public. The Parkdale Library is a true community hub. I love the strong sense of community that persists to this day. I love walking down the street and saying hi to folks even though we don’t know each other. I love the beautiful Victorian homes. I love the big old trees. I love the proximity to the lake and the cool breezes in the dog days of summer. I love the excitement of the CNE at the end of the summer & parking cars on the lawns. I love shopping on Queen West. The dollar store at Queen & Dunn is one of the best. I love the antique shops down by Ronces. I love getting a green army guy with my eggs at The Easy. I love Sunnyside and the boardwalk. I have a thousand misty memories of lazy summer days spent down there as a kid and warm summer nights as a teen. I still love those dinosaurs in the playground. I love St Joe’s – I was born there & so were my kids and one of my grandsons. I love the Palais Royale, the Royal Canadian Legion (branch 344) and the Argonaut Rowing Club, all three fantastic venues with romantic views of the lake. Parkdale is a true neighbourhood with so much going for it and I really long to move back home. I worked for a time at The Cadillac Lounge. Sam Grosso is a treasure. A friend of mine owns Made you Look jewellery. I love Parkdale because it’s like living in a small town within the big city. I live in a great, diverse, vibrant neighbourhood with terrific neighbours. It’s been a wonderful place to raise our family. Today I played a game of horseshoes with my friends down by Sunnyside Park (just east of Sunnyside) …We had played a couple of games and were having a great time when a gentleman showed up who had never played horse shoes, fascinated, he asked to give it a try. We kindly passed him a few horse shoes and my friend Liam showed him how to toss. He seemed so pleased with the opportunity to try something new and to be so readily welcomed. As someone who has considered moving out of Parkdale – as renter who one day would like to be a home owner – I thought “This is one of the many reasons I LOVE PARKDALE!”So happy to be a part of this wonderfully diverse and beautiful neighbourhood. My now husband and I moved to Parkdale, separately, in the late 1990s when we were both students. Cheap rent attracted us, the amazing people and community kept us here. People warned us about the transient neighbourhood. But, it wasn’t long before I knew many of the people who were underhoused and frequently on the street. I never felt safer coming home from late night bar shifts. I volunteered with Parkdale Project Read and in turn learned some Tamil. We found our favourite restaurants and local bars some of which have left, some of which stayed. We moved from the rooming houses on Springhurst through several apartment buildings and finally found our home in the Dufferin Grove Housing Co-operative. We were married a few years ago at the Rhino using the urban art in the Milky Way as a backdrop for our wedding photos. We made our own wedding rings at the Devil’s Workshop. My wedding dress was purchased from Shop Girls. My husband’s suit was from Public Butter vintage clothes. A few years ago my mum was diagnosed with cancer. After a few heart stopping not-so-safe drives to Burlington for some medial emergencies we decided to have my mum move closer to us in Toronto. The only part of Burlington she would really miss would be her garden. Fortunately the HOPE garden was just beginning and that community welcomed her readily. She also found a great church and feels more at home than ever here in Parkdale. We’re all now members of the West End Food Co-op and love visiting the farmers market. We’ve just had our first child. The PARC drop in centre, St. Chrisopher’s Center and the Ontario Early Years centre are great resources. I know we have several alternative schools to choose from when the time is right. I moved out of Parkdale once, for about eight months, to a neighbourhood we might have been able to afford to buy a home. It was not for us. We felt too isolated, and missed knowing our neighbours, passing people we know anytime we’re out and about and of course the great restaurants, bars, coffee shops, art galleries, clothing shops and so much more. I have liked Parkdale for the Dunn park grounds between Lakeside nursing home and the rehab hospital. Volunteers and staff helped make those gardens very charming for anyone walking through but especially for wheelchair strolls by the elderly infirm and younger hospitalized long term trauma patients and families. My mother enjoyed three years of going outside to those gardens. Parkdale’s trees and gardens throughout the area are restful and lovely. I walk down the street feeling the warmth of the community. I can stop and chat for hours, plant with children of all ages and meet new people every time I’m out. I love my neighborhood, the businesses and feel heard by our city representation, residents associations & BIA. I have traveled the world and keep coming back to the most vibrant and diverse community in the world. Parkdale has so much to offer. Great shops, bars and restaurants. A diverse mix of people: rich and poor, all colours of the rainbow. Large Tibetan community. Great antique stores, near Roncesvalles. And, best of all, I can be down to the lakefront in less than 15 minutes by foot. I can go for a walk at any time of the day or night and feel safe. Parkdale rocks. What is there to love about Parkdale? Sorauren Park Soccer! Sorauren Farmer’s Market! High Park! The Film Buff! Parkdale Public School! The Sistema Music Program! The best Antique stores in Toronto along Queen St. The best Restaurants in Toronto on Queen and on Roncy. The best No Frills in Toronto on Lansdowne. Bacchus Roti. Island Foods. A short walk to the Lake. A easy bike ride to the city centre. The bike path. A walk to the EX. A walk to BMO field and TFC . The best rye bread at Benna’s Bakery. A jog to the beach. The boardwalk. Roncesvalles Village. Downtown Lumber. A walk to the Bloor Subway. Streetcar access to King, Queen, Dundas, and College. A walk to the West End YMCA. That’s me riffing for approximately 2 minutes without trying. Parkdale is without doubt the best neighbourhood in Toronto. Parkdale is thriving! I’ve lived in Toronto for 44 years. I’ve owned houses in the Annex and Dufferin Grove area. I’m now in Parkdale on Spencer Ave. It’s the best of the lot. Vibrant and incredibly diverse, people are more friendly and helpful here than anywhere that I’ve experienced. I love Parkdale. Parkdale is my neighbourhood slippers. This is where I feel at home. It’s like a small home town in the big city where everyone knows each other and isn’t afraid to say hi. Parkdale is one of my favourite ‘villages’ to visit, especially on a bicycle! I’m even considering moving into the area due to it’s rich and diverse cultural value. A place where many people new to Canada settle and enjoy.The people are accepted and accepting of each other. Parkdale Collegiate graduates many excellent students with high marks. Love those beautiful old houses and sunny tree lined streets. Just moved here. Love that the people are accepting of my 6 year old with special needs. We feel welcome. My earliest connection with Parkdale dates back to the 1950’s when my fiancees’s parents lived above their retail store on Queen West near Sorauren and I visited almost daily. It was certainly not Forest Hill but not unlike Vaughan Rd. and near St. Clair West where I lived. Today, the area is very vibrant sprouting artsy trendy stores, restaurants and other mixed use enterprises. I love working in Parkdale. Walking around and bumping into friends and colleagues, it feels like a friendly village. The community gardens provide healthy food and activities showing that people care and look out for one another. I’m an artist living at 1313 an Artscape building part of the Artscape Cultural center. Almost everyone is represented in Parkdale the possible exception would be le haut bourgeoisie. Because of the great diversity of people Parkdale is a work in progress. There are those folks who line up at The Saint Francis table for a diner, next door a line of young twenty somethings at the hip Grand Electric restraunt, across the street a small Mosque with prayer times posted in the window further along Queen west a number of Tibetan restaurant and gift shops jostel with Indian and Pakistani grocery stores, small Caribbean and Asian eateries, voila…if Jesus came to Toronto he would probably live in Parkdale. The diversity and energy of Parkdale is what I love about it, after 27 years of living here. People learn to get along with each other. When I came back home, the city didn’t feel like home. Only when I found an apartment in Parkdale/Queen West did I actually feel like I could make a life here. Parkdale is culturally, socially and economically inclusive. Parkdale is friendly and void of vapidness and materialism. Parkdale promotes local economy, independent artists, and green living. Parkdale is more like the Bay Area than any neighbourhood in Toronto. In fact, I’m proud to tell people that I just bought my wedding rings from an unique art collective (Made You Look) on Queen Street and that I’m getting married at the oldest continuously operated hotel in the city (The Gladstone). I love Parkdale and have since I was a child growing up there, for its affordable space to explore, so I could grow up to be an artist. I love the mix of shops and culture and the diverse population. I love Public Butter and the Parkdale public library and the big towers and the cheek-by-jowl sense of community. I love that there’s a part of the city that’s so New York, so dense and interesting. I love the trees. I love that my friends’ band can still afford to practice there, and my painter buddies can paint, and the photographers can pay their rent. It’s a great area of the city, and I love it. The best, most generous and eclectic neighbours you’ll find anywhere! Musicians, philosophers, gardeners, bakers, artists, and writers on every street! While I don’t live in Parkdale, I visit there often and love the area; its diversity, its engagement, the friendly people. I love Parkdale because it offers all the best things in the city. Excellent shops, food, pets, families, smiling faces and it is close to the lake. The diversity of culture and social status shows that Canadians can all live together in happiness. Parkdale is an lovely neighbourhood to live in and I am proud to be a part of it. Parkdale is a creatively vibrant, architecturally interesting, gastronomically happening, truly wonderful part of the City. Long live Parkdale, our next-door-neighbourhood! Hope that helps. Please let me know if there is anything else I can do. Parkdale is a wonderful diverse neighbourhood…In Parkdale we all live and let live, we do not engage in nimbyism. Why I love Parkdale? I love Parkdale because it is located right next to the lake where I can pay reasonable rent. I love it for it’s diversity of people and cultures. The area has enormous challenges but also enormous potential. It’s a great place to live. I love Parkdale because it is one of the most diverse neighborhoods in the whole city and at the centre of everything. It is quiet, old village of maple trees and flower gardens with high rises and multiple 24-hour transit routes. It is perfect for nature lovers because it is so close to the waterfront, the beach and boardwalk, as well as High Park, Dufferin Grove Park, Sorauren Avenue Park and Trinity Bellwoods Park. There is always something interesting to do when you are just a quick stroll from the Exhibition grounds, numerous art galleries as well as the historical buildings and community museums plus all the live music venues of Queen Street. Also, where else can someone find Tibetan, Lebanese, British pub, Turkish, Japanese, Thai, Greek, Chinese, French, Italian, Montreal Deli, Portuguese, Polish, Ethiopian, Mexican, Cuban, Indian, American regional and Filipino cuisine in the same six-block radius? But even more importantly, in this era of continuous gentrification, Parkdale is also one of the only affordable, working-class neighborhoods left near the downtown core with convenient shops and family-friendly amenities. other and are committed to promoting social justice. Because we’re vibrant, cohesive, smart, urban and always in flux! COMPLETELY FOR ITS DIVERSITY – and the fact (true fact) that we can ALL be comfortable – walking, talking, eating, sipping (amazing worldly things! ), celebrating, sleeping, shopping and sharing life… On every corner and porch in the neighbourhood! I have people whose families originate from all over the world living on my block. We have a wonderful time on summer evenings chatting in the street, on porches and in each-other’s homes. We learn so much by talking. It is what gives me hope that peace can exist between different humans on this planet. This is one of the most sought-after areas in the city. I have no idea how anyone can say anything negative about it. Who wouldn’t want to live here? Absolutely a gem in our city. Let’s grow Parkdale even more. Let’s let the small guy prosper. Let’s sustain locally. Grow locally. Be local. Parkdale has been our home for over 30 years. We love that Parkdale is an all-inclusive community; welcoming and accepting all peoples including those who suffer from a variety of disabilities and sicknesses. Residents here are giving and caring as confirmed by acts of generosity such as the Sun Fa owner and patrons giving generously to PARC to name but one. We love the proximity to our beautiful Lake Ontario and the many trails and parks we can use for keeping in touch with Nature in such a busy city. When I first walked past the Dufferin St Bridge back in 1983, and came upon the glorious architectural and multicultural wonder that is Parkdale, I was breathless for a moment. There I was with my little son in his stroller and I said to myself, this exciting place feels like New York City, where I’m from, and I want to live here. And I’ve been here ever since. I’ve lived in many places, all over North Amercia, and this is the most welcoming and most exciting place to live that I’ve ever known. do so for this reason, and the ones who aren’t open to embracing the width and depth of our humanexperience, eventually leave. Every friend of mine who has left Parkdale has expressed to me that they wish they hadn’t. There’s no place like this. It’s real, it’s great, it’s magic, it has soul. Sometimes I like to call Parkdale the Wild West. That’s because, in the over 30 years that I’ve lived here, it seems to be always in a state of becoming. Different ethnicities dominate from time to time, but so far gentrification hasn’t taken over, and although I own a house here, I hope it never does. A little bit is okay, because we like to have a bit of everything here. Our commercial enterprises, our restaurants and food stores reflect this diversity too, so you feel like you’re always travelling to a distant land overseas somewhere, in your neighbourhood walk. Roncesvalles is close by if you want even more variety in your shopping experience. Living close to the lake with a more temperate climate, our weather is 10 degrees warmer in the winter and 10 degrees cooler in the summer than most of Toronto. The lake offers us close access to big nature and as well, High Park is close, too. And the exhibition grounds are a magical place for a walk when you want to dream and have access to a big sky. I’d like to see more arts pop up in the grounds there. I like to call Parkdale the Village of Dreamers. There are more artists in Parkdale than anywhere else in Toronto. There are people from all over the world who land in Parkdale with the dream of a better life. There are the wounded dreamers, the folks in transition who need inclusion in a community somewhere, and who enrich our lives by sending us the message that our culture still needs to heal and to evolve to include them properly, which keeps us open to explore and evolve new ways of doing so instead of hiding our heads in the sand. The gift I get from this as well is that I can walk to my corner convenience store in my pyjamas sometimes, and no one thinks I’m crazy. There’s a freedom here that can’t be found when all of the community is locked into the same head space. Thanks for the opportunity to express my love, too. It is not for nothing that people say that “Parkdale is the Neighbourhood that cares.” They also say that “Parkdale is a village“. In my twenty years living and working in Parkdale, it is impossible for me to walk three blocks without several people saying hello. We know each other, talk to each other care, about each other and look after each other. The whole world comes to Parkdale, which gives it an almost unique multicultural flavour, we see this in an incredible diversity of food choices and cultural events. We are especially lucky to have the second largest Tibetan community outside of India – a truly lovely people . Entertainment – wow. An active night life ranging from blues to rock to jazz, especially with our incredible neighbour on Roncesvalles, Hugh’s Room – one of the best Jazz venues in Toronto. We have an incredible social mix – mansion owners, house fixer-uppers, non-profit housing and importantly, a wonderful lack of condos; well serviced non-profit housing for newcomers as well as those in poverty,seniors those with addictions and/or mental health issues, and the disabled. We get along with each other VERY WELL despite different backgrounds and care about each other as true neighbours. Last but not least we have the magnificent lakeshore, cool breezy parks including the 500 acre High Park, tree lined streets, the Exhibition, Lamport Stadium (home of the Toronto FC soccer team), Art Galleries, Antique Stores, Cafes, Cultural Centres, as well as the Parkdale Community Health Centre and St,. Josephs Health Centre – all within walking distance. Add to that great TTC connections and it doesn’t get any better than Parkdale. A great mixture of people from different cultures and financial backgrounds, all of which find more similarities then they do differences. People are friendly and approachable, something you dont find everywhere. Lived here for nearly thirty years, first on MacDonnell now on Cowan, wouldn’t want to go anywhere else in the city, best neighbourhood and best neighbours you could hope for.People who run down Parkdale are simply envious that they don’t live here! What’s not to love? Everything about this neighbourhood exemplifies real life in an urban centre. Real people living their lives, day by day. I wouldn’t live anywhere else! In fact, I’d rather live in Parkdale than Rosedale (no offense intended, Rosedale). that many less well-integrated communities could emulate to their benefit. Is an amazing neighbourhood rich of diversity. You can enjoy food from all around the world. One can walk down the street and be greeted warmly by many. There is great pride by those who live and work there. Parkdale is what makes Toronto an amazing place to live! 1. Parkdale is eclectic, diverse and brings together many worlds of people and different experiences. Generally speaking there seems to be a sense of respect for the many perspectives and differences. I see lively conversations between people on issues and that is good. People care and they are talking! 2. People are friendly in Parkdale. In the time I’ve lived here I’ve met so many friendly people. People routinely say “good morning” and greet me on the street. When I used to park my bike at Queen and MacDonnell to catch the streetcar to work, there was a man who used to call me “dear;” — he watched my bike to ensure no one stole it when I went to work and left it there all day. 3. Parkdale has it all! We have community services that bring us legal, food security, health and social services. We have unique and creative small businesses and hopping clubs that bring life to our streets, and we have amazing international grocers, hardware stores, groceries and city gems like “Designer Fabrics.” We also have amazing annual events and festivals. I can’t imagine living anywhere else. I truly love Parkdale and anyone who thinks otherwise has an open invite to spend some time getting to know our neighbourhood. It is one of the most desirable areas of Toronto. Great shopping, excellent connection to the TTC and subway, close to the Lake and close to one of the best Hospitals of Toronto, The many trees in the the streets where people live, makes it a prime area for living. For families close to churches and schools. Hey what more do you want? I live in Etobicoke because of my work, but I still visit Parkdale! Walking the side streets with the old homes and large trees is something I enjoy about Parkdale. During the day I feel very safe in the neighbourhood. I am someone who does not go out alone after dark wherever I am so I have no measure of evening and Parkdale. Everyone talks about the creative city, how much creativity contributes to the economic and social as well as cultural well being of the city. But no one wants to talk about where real creativity comes from (poor artists, mainly) or what happens to the neighbourhoods where creative people cluster. Such areas should not be insulted, over-policed, cleaned up, gentrified or eliminated. Not if you want the city to be a place where things happen outside the institutions and corporations – however much they profit from creative visions. Parkdale is a special place in the city. Other than creating more affordable housing, keeping the libraries and cafés going, ensuring that transit works and is affordable, and funding individual and neighbourhood art projects, the city should leave it respectfully alone. I love our awesome parks!! Many’s the day you can find me hiking at the beach with my trusty Maltese in tow. All seasons Parkdale rocks! Parkdale represents the best of Toronto; diverse communities, open-minded, liberal values and people always ready to help each other out. If the rest of Toronto had the spirit of Parkdale, this city would be a much nicer place to live in. Watching all the kids playing and growing up on Cowan Ave. The babies in strollers when I moved on to the street are now in college and making their parents proud. The new kids just keep a coming – beautiful, spirited, great kids who are growing up on a street where the neighbours are friends and we take care of our own. Parkdale is colourful, diverse, full of interesting and very friendly people. Parkdalians are helpful and watch out for each other more than I have ever witnessed in my 20 years of working with older adults with a variety of challenges in different parts of Toronto. Parkdale has so much to offer in so many areas – arts, culture, dining, shopping, activities for all ages, health care, social networks (the real kind, not virtual), social services, places to eat, play, laugh, connect, heal and just BE. I have worked in Parkdale for over 10 years and my colleagues call me the “Queen of Parkdale” as they know how fond I am with this neighbourhood. I lived in the heart of Parkdale for nine years before moving to Roncesvalles Village still called Parkdale in those days. I love the neighbourhood. People look out and care for each other whether they are more or less fortunate. My kids are growing up with a level of freedom that would be the envy of many a neighbourhood. I’ve had helped total strangers and total strangers have helped me or my family on occasion, although it is hard to find total strangers after so many years in the “hood”. The generosity of our people is also amazing. The area has its challenges but this is what makes a dynamic community. If all was beauty and order how would we truly know what to strive for and what we are capable of? – Simply thinking about Mother India Roti makes my mouth water. – My Parkdale jogging route offers a lovely view of Lake Ontario. – The Parkdale Public library is a great space for events, including concerts. – The neighbourhood is vibrant, diverse, and full of things to see and explore. Why I love Ward 14 – A little bit of everything that Toronto has to offer, conveniently located in one Ward – Ward 14. Having lived here in my early childhood to return in my thirties I am pleasantly surprised daily by the creativity, compassion and people that make this a multidimensional area where I want to grow roots. I used to live in Parkdale in the early 2000s & now reside close by @ Ossington & Queen. I love love love Parkdale. So much character – it’s everything I adore about Toronto: great people, restaurants, shopping, coffee & it’s got that distinct Parkdalian vibe. Most of all it’s just real, honest – no pretense. I love Parkdale very much we diversity group of people ,get together friendly and live happily. Here is no doubt we friendly meet in Sistering Institution, Library and in Health center. Happy memories: my grandparents lived there in the 50’s. I worked in Parkdale for a few years and remember being positively amazed upon being told that there were over 90 languages represented by the kids in Parkdale Public School. It’s an amazing neighbourhood. My favourite: West End Food Coop, Sorauren Farmers’ Market, Bacchus Roti, Designer Fabric Store. Parkdale is a quirky, arty, diverse, vibrant and accepting ward, and one I will continue to visit and enjoy. I may not live within your boundaries, but I’m with you 100%! I love living here. Please tell this man to stop making Parkdale the object of hate because the people want to be treated as human beings. There are good things that happen in Parkdale. I am hoping he will see it someday. Since long time I live in Parkdale. Me and my community are very proud to be part of this community. If you want to fix the people you have to fix yourself first. Don’t have misunderstanding for the Parkdale people. Please think yourself first before you talk. We are really so upset about what you said about the sexual offenders in the Parkdale area. When you say something like this to the media, you think you are going to give us bad names. Look at the history since 100 years ago. Parkdale is very proud and very rich in the city of Toronto. When I walk anytime in Parkdale day or night I feel very safe and proud. It’s the best damn neighbourhood I’ve ever lived in, and I’ve lived in five Canadian provinces and the UK. The people are there are wonderful and it has everything you could ever need. orientation….unlike any other in Toronto!! I’ve lived in Parkdale for 5 years have worked in the neighbourhood for a few years as well. I’m lucky enough to have gotten to know many residents and community members- as a neighbour, a community gardener and a friend. Before I moved here, I was a typical person in my early 30s, hanging out with other people exactly like me – early 30s, raised middle class, university educated, English literate, white (ok, I’m not white but…). I hit a stint of unemployment and began to seek out free social outings. Through this, I chanced upon Greenest City’s Community Kitchens, where gardeners in the off season would gather to share recipes, prepare a meal together, and then sit and eat together. This then led to my involvement as a volunteer, a member of the community garden, and eventually a staff member. At the same time, I began volunteering with Parkdale Project Read, and an amazing thing happened- I would run into people I worked with at Project Read at the Masaryk-Cowan Centre; I would run into H.O.P.E gardeners on Jameson St or in the library; the gardeners’ grandkids would show up in my after-school program… I had never felt so connected and integrated into a community in my life. And these Parkdale community members came from all walks of life- a huge range of age, colour, religion, education, value system and life experience. It was the first time in my life that I had ever had such diversity in my everyday life and friend circle. And it made a profound impression on me. I love Parkdale because, despite our reputation as a vibrant, multicultural city, it is commonplace to walk into a bar or restaurant in so many neighbourhoods (Roncesvalles, the Annex, Little Italy, the Beaches, the Junction, Bellwoods.. and the list goes on) and not see any diversity at all. Where everyone is the same- youngish, middle-class, university educated, English literate, (mostly white), never having experienced any major barriers or challenges. You can live an entire life like that- just hanging out with people who are exactly like you. I love Parkdale because such homogeneity of experience is impossible to find here. I feel richer for the connections I’ve made here. I feel richer for learning how to celebrate and empathize with life experiences so different from my own. I feel richer for hearing people’s life stories; their worries, their joys, their struggles and their passions. I feel incredibly grateful and humble to feel a part of it. This is my neighbourhood, and I will never leave. That IS the spirit of Toronto in general. Parkdale is beauty, parks, greenery, beautiful buildings, lively, diverse, interesting, always unusual, enlightening, fun, great food, great people. Some councillors have some very strange ideas about how local communities work and I’m thankful that I live in Parkdale where there is a healthy sharing and genuine love for fellow human beings. As the mother of two young girls that attend Parkdale PS, and a member of their PTA, fundraising and safe schools committee as well as a proud Torontonian let me tell you how I feel about living here. I spent most of my childhood and teenage years in Scarborough and have since lived in a few different areas of our city. Markham and Kingston Rd, Yonge and Eglinton, St. Clair West and Bathurst, and for the past 10 years have lived in the Parkdale area. We first lived on Springhurst Avenue and Dufferin until we bought our house over five years ago and now we reside at Queen St. and O’Hara Avenue. I absolutely love living here. My girls have been born and raised in this neighbourhood. The street we currently live on, O’Hara, has the best group of young families very much like my own. Our children go to the same school. We take care of each other’s children and are very much a wonderful group of supportive and loving people. It is like having an extended family just outside our door. I have never lived in any neighbourhood with so many great friends that always come together in a crisis. Our basement was recently flooded and once word spread that we were having trouble, neighbours just showed up with de-humidifiers, giant fans, and offers of “What can we do to help you guys?” These neighbours pick up my children if I am running late and I pick up theirs if they need me to do so. Our children are important to us and so are all their friends. Like the old saying, “It takes a village to raise a child.” Very true. Another reason I love living here is that our school is very inclusive. We have families from many different countries and backgrounds. Something that is very important to me. Treating everyone no different than anyone else. But also with respect and kindness. A few months ago a few friends of mine and I were heading downtown for some birthday festivities. A gentleman in an electric wheelchair was stuck in the middle of the intersection, I believe it was on Jameson. He seemed to need some help. His chair wouldn’t work and traffic was trying to turn but with him in the way I feared he would be hit. My girlfriends and I, without any concern for our safety, jumped into the street to try and push him back onto the sidewalk. It took quite a bit of pushing as it was a very heavy chair. Another few strangers came to help us too. We finally were able to get him out of the street. He was thankful towards us and we even made sure he was able to start it up again to get to where he needed to go. These are the moments that make me happy to live somewhere that I am able to just be helpful. As a community. I see that quite a bit in our neighbourhood. Yes, there can be times that are scary, or even possibly dangerous, but that is not unlike any city or town. But I strongly believe that you can either help or hinder your own community. I spend much of my time with my daughters while my husband works long hours. I take them everywhere in our neighbourhood. We stop by our local corner store where the owners know my girls and whom I occasionally bake them cookies because like my own parents, I know how hard they work. We go to many of our local parks and playgrounds. I don’t worry about “something happening” because I don’t want to teach my daughters to live in fear…My life is my own and I don’t choose to live it in fear. Yes, my children know and are aware that people are not always friendly, or even have good thoughts. They know that people can hurt children. Regular looking people. But that doesn’t only apply to our neighbourhood. That’s every neighbourhood!! But the friends and neighbours I know and see on a daily basis only makes me want to stay here as long as I possibly can. Because leaving here isn’t just about leaving our home. Our home is now our school, our teachers, our friends at school, our neighbours and our community. … I am lucky to be living in such a great neighbourhood. A great city, province and country. I will always be protective about my family and children. But that also includes all the children I’ll meet…Thank you for hearing my voice. I love the sense of grandeur! It is truly regal! I’ve been a Parkdale resident for 27½ years, and I have made many friends in this area! I even have a couple of relatives here too, and we all have each other’s backs. I feel very safe walking at night, and only on a couple of occasions have been pushed around by some people who have since moved out (good riddance to them). I would never trade Parkdale for any other area!! I love Parkdale because, first, my teaching career began at Parkdale Secondary School in 1965 and lasted until 1970 when I started the Factory Theatre Lab with Ken Gass in 1970. Parkdale has lived in my heart ever since that time. I live Parkdale because of its multicultural nature, its warm and lovely embrace of people, and its wonderful name. Parkdale is a wonderful, diverse community. People here are accepting of other cultures and are much more peaceful. Our voice is heard! People here are so down to earth, friendly, and helpful! I love being here. Parkdale may be viewed as being a bit rough around the edges, but that is one of the things that drew me to the area when I moved here from Hamilton 8 years ago. It is a wonderful area, with such diversity of people, restaurants and shops, and I never feel unsafe. When my family first moved to Canada from Poland they also settled in Parkdale – and that was back in the early 1970’s. It was a great area back then, and still is now. LONG LIVE PARKDALE. Parkdale is Canada at its best. For decades it has provided sanctuary to the poor, to vast numbers of new Canadians, and to those facing health challenges too often ignored by society at large. The Parkdale community has been stellar in the way it has reached out to these communities, providing them with places of comfort and safety, integrating them with the artists and entrepreneurs who keep this city vibrant. The world needs more Parkdale and I’m proud to have been raised there. While I am not a resident of Parkdale, many of my friends are, and I have always enjoyed spending my days in the neighbourhood soaking in its surroundings. I grew up in a small town from a low-income family and Parkdale has always felt like “home” to me because it is the epitome of a place where people of all backgrounds and walks of life gather. At any time of day or night I feel safe walking in the Parkdale area. I chose to raise my family in the Parkdale area. I have worked there and one daughter attended school there. Parkdale is a family oriented neighbourhood that is full of diverse, lively residents. I do not live in Parkdale, but enjoy Gallery 1313, an independent artist run gallery in the midst of Parkdale, and greatly admire the work done by the staff and students of Queeen Victoria Public School – a very welcoming place for students whose families have come from all over the world. The work done there is creative and effective – a great place for kids and their families. I moved into the neighbourhood just over a year ago, and I absolutely love it! Great Tibetan restaurants up on Queen street, friendly neighbours from all over the world, Parkdale library is wonderful. I’m a lawyer and I bought a loft in Parkdale two years ago. As a woman, I have never felt unsafe in my neighbourhood. In fact, I’m proud to call Parkdale my home. It’s a neighbourhood where individuality and diversity fluorish. And from our local food co-op to some of the best restaurants in the city, Parkdale is a bastion of local business creativity. I feel that people who don’t appreciate this fair neighbourhood are likely giving in to unfair stereotypes and prejudices. If they only approached Parkdale with an open mind and heart, they would see how special it is. I like the area because of all the friendly people and for the unique stores we have in the neighborhood. My husband and I live in Leslieville, but we often have opportunities to visit Parkdale…to ogle the beautiful old houses in the adjoining side streets or to attend some event in the neighbourhood. It really is an interesting, attractive, colourful section of our city and we would all be the poorer without it. We are so lucky to have such a variety of different neighbourhoods to enjoy in Toronto. You may have heard the awful slur one of my colleagues has made against our wonderful neighbourhood. I want to say how saddened I am that Parkdale has been attacked this way. As we all know Parkdale is the kind of community everyone in Toronto admires. We are economically, socially, and culturally diverse. We accept and welcome and love each other. If the rest of Toronto were more like Parkdale, Toronto would be an even better place to live. Many of my colleagues have already contacted me to see how they can help stand up for our great neighbourhood. You may be hearing from some of them in the media. Rest assured this attack comes from one irresponsible voice. I lived in Parkdale for years, and I miss it. I love the Tibetan restaurants, the vintage shops, the proximity to Lake Ontario, and the diverse, vibrant communities that call it home. The diversity, the fact I can walk 5 minutes from Queen and Roncesvalles and hit either High Park or our beautiful waterfront. It is a jewel in our city. I love the wonderful music and restaurant scene in Parkdale. On any given night artists are at work, and hungry crowds enjoy the plethora of options from the diverse variety of cultures. From the grassroots work of the West End Food Co-op to provide farm-to-table options to the environmentally sound choices of the restaurants in the area (i.e. Cowbell), Parkdale has something to offer each and every visitor. I’m proud and lucky to live so close to such a wonderful and vibrant community. I’m actually a Junctionite but I spend a lot of time in Roncy and Parkdale because of its vibrant restaurants, unique vintage clothing stores, Sunnyside Beach (the best beach in Toronto!) and the local arts scene. Viva la Parkdale! Our community is a rich, vibrant, multi-ethnic neighbourhood in which people of all different walks of life and people who have mental health issues are not marginalized, as they would be in other parts of the city. I think the fact that our neighbourhood’s great diversity, not only in terms of culture and ethnicity, but also in terms of race, class, and ability, is its greatest asset. It’s my favourite part of the city to live in, by far. It’s resisted a lot of gentrification, as well, unlike other neighbourhoods, which have forced out people who have been unable to keep up with rising costs of living and less affordable housing. I’m a proud Parkdalian! Because it is a safe haven from Starbucks. Because rent is low enough I can live downtown, enjoy walking to art galleries and lakes and continue to work in a social justice organization. Because people diversity = food diversity: from food co-ops to hipster bars to food banks to ethnic food to PARC’s daily meal service & Cowan-Masaryk Christmas turkeys to community gardens – nobody goes hungry. Because it is walkable and also serviced by many transit lines. Because everything from Rails (programming social) nites to poetry readings to gallery pop-ups to activism happens within walking distance of my house. Because our community provides: from legal aid to PARC to the holistic approach of the Parkdale Community Health Centre. People in the neighbourhood are generous with others. Three years ago when the Parkdale Community Food Bank nearly went under, residents pitched in to raise more than $100, 000 to go towards rent and keeping the lights on and fridges running. We were so grateful to be able to continue to provide this much needed service. There are so many reasons to love the neighbourhood. I can start with the wonderful restaurants, to the wonderful shops and the wonderful parks. I regularly cycle through Parkdale and so enjoy going through all the side streets with the beautiful housing architecture. Parkdale is a neighbourhood with character. Don’t ever change. There will be continuous work done over the weekend beginning at 7pm on Friday, June 13 until 5pm on Sunday, June 15 between Bloor St. and Lansdowne Ave. Ballast mats are being installed under the tracks to reduce train vibrations. This work can only be completed when there is no train service. Indoor Leisure swimming will be free effective July 1, 2014. Please note: Fees will continue to be charged for lane swimming. For a list of pool locations visit toronto.ca/pools. Credits/refunds will be available for leisure swim pass holders and punch cards for any remaining term beyond June 30. For more information go to toronto.ca/parks or call 416-338-4386.